Crossing the threshold into adulthood is signified by many telling things. Paying off a constant bombardment of bills, for instance — and reckoning with forces like quickly decelerating metabolisms and heartburn (after just two slices of pizza, at that). It’s also marked by a slow-but-sure learning process where habits shift — where you begin to optimize your routines, learn what to invest time and money on, and generally how to live better. Figuring out all that stuff takes time, though, and it’s much easier to just ask other people who’ve been there, done that. 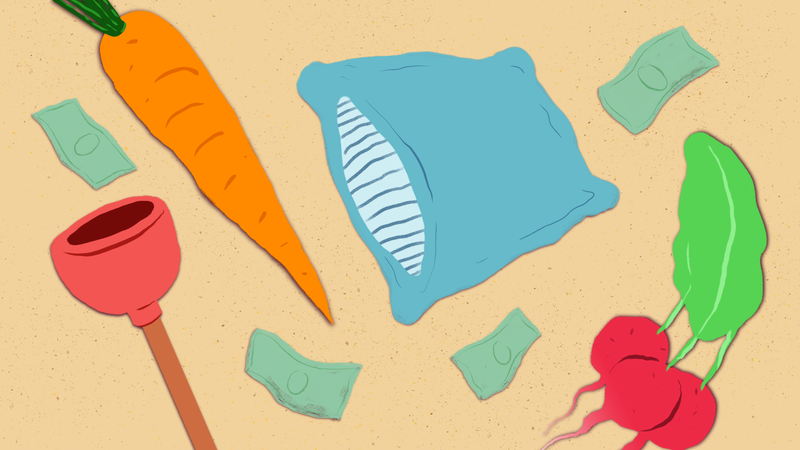 So, from someone who’s been adulting for a few whole years now (and with plenty of advice from much more experienced adults), here are some of the things that are always worth the money. I’ve never really found the “Think about what you put in your body!” admonishment compelling, since I often think that my body just wants a greasy cheeseburger. Instead, it’s more effective to remind myself that stateside healthcare is extremely costly, and maintaining long-term wellness will mitigate those expenses. Spend more on meat raised without antibiotics, and use this guide to find seafood that’s raised or caught with minimal chemical use and damage to habitats. When it comes to produce, buying fresh, local, and in season will provide various benefits: Not only is it cost effective, but fruits and veggies are also at peak taste and vitamin content when they’re picked while ripe and consumed quickly, rather than being trundled cross-country on a truck. Vending machine confections have passed their heyday: 40% of the snacks consumers carry these days are classified as healthy, and better-for-you snacks are readily available on supermarket shelves. If you’re craving something savory, reach for nutritious picks like seaweed snacks or dry-roasted edamame. For sweet treats, indulge in Nature Valley Granola Cups, which strike the perfect balance between creamy and crunchy, decadent (chocolate and nut butter!) and wholesome (whole-grain oats and nuts). Cooking is a skill that’s worth investing time in, since it’s conducive both to saving money and eating healthier meals. Even if your cooking savvy is questionable, investing in a few good knives — or even just one chef’s knife, which are extremely versatile — will make a significant difference in the kitchen. Here’s a great guide to essential knives. A cast-iron skillet is another must-have; with proper care, the thing will last a lifetime, and it will only set you back about 20 bucks. Nights! They happens every 24 hours, and it’s in our best interest to spend most of them sleeping. According to The Handbook of Clinical Neurology, we spend a third of our lives sleeping, or trying to do so — all the more reason to invest in things that’ll make our beds more comfortable. Good mattresses will make a difference in your sleep quality, but they can be prohibitively expensive. Try retailers like Casper and Tuft & Needle, which offer 100-day trial periods before you decide whether or not to commit. Another alternative is buying a mattress topper, which can elevate a sad bed without breaking your bank. The same philosophy applies when buying pillows, comforters, and sheets — quality products will make the difference between the feel of a cheap motel and a snug, serene sleep sanctuary. (A friend of mine even “has a guy” for quality sheets.) Another thing to consider: If you’re sharing a bed with a blanket-hogging partner, picking up an extra flat sheet and comforter might save your relationship. There’s a reason that apartment maintenance, be it cleanliness or even interior decor, can cause so much strife between roommates and partners. Upkeep of a living space is important, and it’s psychologically beneficial to retreat to a place of comfort and belonging. My roommates and I went through a series of cheap vacuums, which all disintegrated in a matter of weeks and ended up on the curb. We’ve since invested in a $200 vacuum that not only works better, but has already lasted us several years with no loss in efficacy — extra important, since I’m the mother to a furry pet. A fancy surround-sound system isn’t necessary unless you’re a serious audiophile — but if you find yourself engaging in any type of passive listening (putting on podcasts or music while you perform chores, for instance), decent speakers are worth investing in. If you’re not sure where to start looking, a good portable bluetooth speaker is a breeze to use and will serve all of your basic audio needs. Buy a heavy-duty toilet plunger before you need one. Have you ever lived with a serial toilet-and-drain–clogger? I have, and none of us were ready until it was too late. And while we’re on the topic of lavatorial habits — if you haven’t stocked your bathroom with strong, two-ply toilet paper, you’re not living your best life. Depending on your lifestyle and personal interests, there are countless areas to be optimizing for the future, and this is by no means an exhaustive list. Readers, what are the things you believe are always worth splurging on? Tell us in the comments!